News: Base Raiders is in layout! Hooray! Raillery is on hiatus until Base Raiders is complete. Boo! 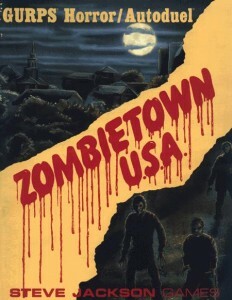 Synopsis: Tom and I once again dive into the “Pile of Broken Dreams“to look at two old modules, Zombietown USA for GURPS and All Fall Down for Cyberpunk. Adventure design was quite different back then. For example, a brutal dungeon crawl was apparently required for every scenario, regardless of genre. Railroading was very popular as well. Regardless, there are useful elements from each scenario. Also, Tom does not care for the needless inclusion of Autoduel stats for a horror scenario. Oh and Tom has a letter too. Plus, shout outs and anecdotes! Channel A: A truly fun game for anime fans AND haters. Listen to our special Actual Play! Fate Core: The new edition of the Fate RPG system and it comes in a handsome book. Boss Monster: A new 8-bit video game inspired card game. Kill the heroes before the other monsters do. Nazi Occult: A fictional recounting of the Nazi’s experiments with the occult. Werewolves and djinn, oh my! The Curse: A modern retelling of the Colour out of Space. VHS 2: The third segment is creepy as hell. I enjoyed the second segment. The first and fourth ones…eehhhhhhhh. I liked this show setup. You should do it again. Pick a scenario or three and say critique them. One show could be about 3 good once and what in them makes them good (Home of the brave / land of the free Cyperpunk check it out). Another could be about a couple of classics like (Against the giants DND on the oriental express COC) and why they are famous. I think it could be fun from a ‘how can I make my game better/what shouldn’t I do’ perspective. I bought Zombietown, USA when it was released. I don’t recall actually playing it, but I remember I used the description of the town for a different scenario of my own devising (again, I don’t remember what — it was a long time ago). The scenario was weird, disappointing, and troubling, but at the time there wasn’t a lot of zombie stuff out there (even though this wasn’t a zombie thing, per se), so it’s always stuck in my head. My impression of the town was that it was meant to serve as an all-purpose horror venue, or even non-horror. That was actually fairly common for scenarios like this back in the day — when you bought one, you expected to get material you could mine for many different games. But the Autoduel stuff struck me even at the time as a bizarre hybrid. IIRC, Car Wars and all its accoutrements had already peaked in popularity and had begun to recede (quickly, I might add) when this was released. It was a bizarre mix, and I recall spending some period of time trying to imagine how it would work if you were a bunch of road warriors just blowing through town. I never did figure it out. Fun episode. I liked the combo of news, current product review and old product review. I think our next episode will be a review of 2 recent scenarios so we can see how game design has changed over the years. I look forward to the comparison show. And here we go: Trot Hard. Gentlemen, your lunacy reached back through time on this one. This format was really cool! There better be Tom’s “AUTODUEL!” available as an mp3 next kickstarter so I can have it be my text alert. I was so glad he had a letter and I look froward to the videos from Tom.